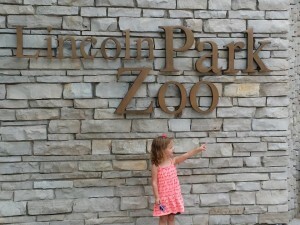 This past weekend, my stepdaugther, granddaughter and I went to the Lincoln Park Zoo, Chicago, IL. It was a fun girls day out. We had never been there before and although it took some time to drive there and it was like a maze to get through the town of Lincoln Park, we made it and had a blast. We pulled in and immediately grabbed the closest parking spot we saw but come to find out we could have probably found one closer to the zoo entrance. We parked close to the parking lot entrance and walked past the river. There were tons of rowing teams and long rowing boats on the grassy area near the river. We made our way to the zoo and first grabbed lunch. I was lucky they had something for me, the vegetarian. It seemed they had a nice variety of items I could get but I went with the taco salad. Very accommodating and friendly staff. We spent the rest of the day checking out all the animals. Check out all their new arrivals. Our granddaughter is almost 4, can’t believe how fast she’s growing up. 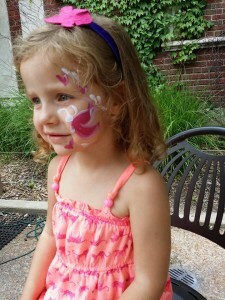 We stopped to let her get her face painted. The gorilla habitat was the most exciting to me. 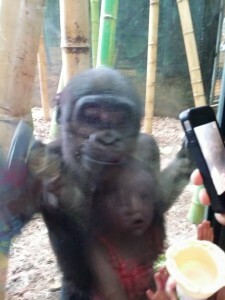 One of the baby gorillas came right up to the glass where Isabella had both her hands an put his hands and face up to hers. It was quite spectacular. Just look at her expression in the glass. Ours was just as shocking as I fiddled to get the camera app on my phone open. Lincoln Park Zoo is free but there is a large fee for parking. I paid $30 for us to park but it depends on how much time you spend there as to how much you’ll spend. 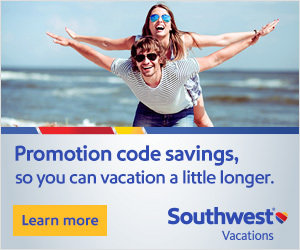 If you are a zoo member, you’ll get discounted parking. Pay at the exit lot when you are ready to leave. We really had a good time and I recommend you visit if you’re nearby or ever in town and want to go to a fun zoo. It’s not as big as the other zoo in Chicago, Brookfield Zoo but I would still recommend it. Have you ever been to the Lincoln Park Zoo, Chicago, IL? I’ve not been to Lincoln Park Zoo in quite a while or Brookfield for that matter. But plan to go to the “Festival of Lights” this Fall at Lincoln – that looks like a pretty awesome exhibit. I passed by it last year on the bus to visit my mom one day and it looked really cool. Thanks Missy, she is adorable! We really enjoyed that zoo. Brookfield is just so expensive these days although they do have more to offer.